Question regarding wiring the quillions for a kylo conversion.. I have dr/dr/w on the main, and a single dr on each quillion. Can I just wire the quillions to the power pad as indicated in the manual, but without a power extender since I’m using only a single led on each? The manual shows a pex required on a rrw led for main ANDquillions. They used a pex only because they were wiring FOC in the quillions. If you're not wiring FOC in quillions, you can use channel 1 for 2 main reds, channel 2 for the quillions, and channel 3 for your white FOC in main blade. If you set it up this way, you will not have FOC in quillions. Jordan from SoCal says that is the accurate thing anyway. If you want FOC in quillions, then you may need the pex, but you're only running single crees. Wire them both to channel 2. That is inferred in the directions. Channel 2 will be your delay channel. You will have some work to do in the configs on your SD card. I did mine like this dR/dR/G. The main blade had both reds run on Ch. 1, each side only used 1 of the reds on Ch. 2, Ch. 3 was the greens in each. Channel 2 is set to delay. Runs fine, no issues. I suggest using a high-drain battery though. PS, if you wanted FOC in all 3 blades (if you had tricrees in quillions), you probably could wire all 3 FOC diodes to channel 3; however, you'd have to reduce the amp load between the 3 diodes to not exceed the rating. Which is possible, because you don't need the quillion diodes running at full chooch, because the quillions are so short. You can run them at 50% (500) in the settings, and they will still be as bright as main blade. Of course the white in your main blade would similarly be reduced; however, it flickers between the white and red anyway if you have your FOC configured. I believe each channel is good up to 4A, so the three leds going on FoC shouldn't be an issue, never has been for me once I upgraded to a higher drain battery. Before that, the speaker would fuzz during lockup and overall it'd dim, that aside it works great. What im gonna do is, wire the two DR leds from the main to channel one, the two single DR's from the two quillions to channel two, and the main blade White foc to channel 3. The only thing im worried about is the battery choice. I'm not using an RCP and decided to go with removable batteries. I have the trustfires from tcss. they're lower mah than my usual wired panasonics. Should I go with a better battery? the Keepowers maybe... would they fit the trustfire charger? On my in-hilt Kylos I use higher quality batteries with higher mAh. Initially running KP 18650s, and Obrtronics. Now I'm running 26650s in all my Kylo sabers mainly out of necessity for how I use them. I need them to last a long time usually. 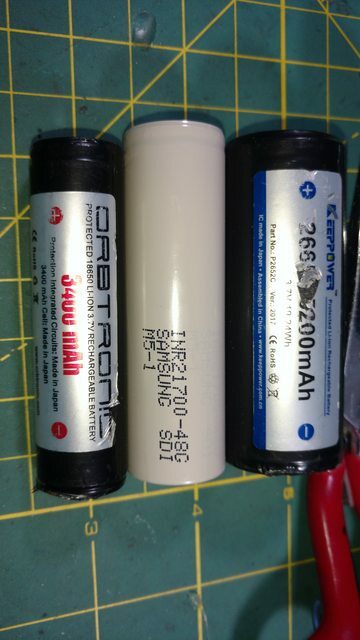 Are they larger than 18650’s and what’s their voltage? Do you keep the saber on for long periods of time? 18650s are 18 mm in diameter. 26650s are 26 mm in diameter, so yes, they are much larger than a 18650. I run my saber for hours at troops. I just ran it for 3.5 hours (on and off, but on a great deal of the time) last week. That saber is a Neopixel Kylo. The battery was toast at the end of troop. No way an 18650 could have done that. 18650s will run the saber in your configuration for about an hour. Less with the trustfire than with the higher mAh batteries. Yea I just found out the trustfire is under an hour on.... dammit. So best I can expect is an hour with an orbtronics 3400mah?